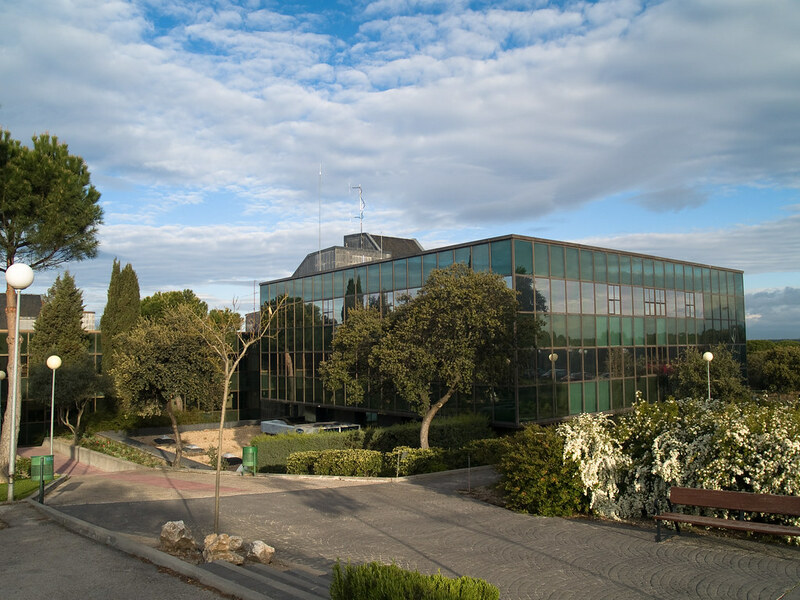 The technology Campus Montegancedo obtained the name of Campus of Excellence by the Ministry of Education in the 2010 call. Previously, I2-Tech of Montegancedo Campus received the recognition of Promising Project CEI 2009 by the Ministry of Education and Science (MEC). The campus also received the category of “Excellent IT and Technology Transfer" in the first phase open by the Ministry Science and Innovation (MICINN). CoNWeT Lab premises are in building 4, 3rd floor. Here you can see its map location thanks to Google Maps. The GPS coordinates are: 40°24′22.82″N, 03°50′19.86″O. Bus #865 (See pointmap #2) comes from the "Ciudad Universitaria" metro station (L6), and then stops at the School of Computing, in front of the building 6, just a couple of minutes walking to building 4. The trip takes about 15 minutes. Bus #591 (See pointmap #3) comes from "Aluche" (Metro Aluche, Line 5, and Cercanías (train) Line C5) and it can also be taken in "Colonia Jardín" metro station (Line 10). This bus leaves you between buildings 4 and 5 and the journey takes about 10 minutes. Bus #573 (See pointmap #4) comes from "Moncloa" (Ruperto Chapí st.). It stops outside the School of Computing, in "Urbanización Montepríncipe". The building 4 is about 5 minutes walking from the bus stop. Although it departures from Moncloa, we don't recommend it, because it takes about an hour to get CoNWeT. However, this is the bus to be taken if your hotel is in "Ciudad de la Imagen" and you don't want to take the tram. Bus #566 (See pointmap #5) comes from "Pozuelo" or "Boadilla del Monte" and stops outside too. We don't recommend this bus. Tram #3 (Map - 5). Trams in Madrid are known as "Metro ligero". Line 3 comes from "Colonia Jardín" and it has stops in "Ciudad de la Imagen". To reach CoNWeT Lab, you have to leave the tram in Montepríncipe station, and then, take a 15 minutes walk along the "Avenida Montepríncipe" to get to the School of Computing by the right side of the street. If you want to come by car, you have to take the "M-40" highway, and leave the road on the exit "36" if you come from the South, or the "38" if you come from the North. The following map shows the path from the M-40 highway to the CoNWeT Lab. Terminals 1, 2 and 3 (T1, T2 and T3) are collocated and can be reached by metro with the underground station "Aeropuerto T1-T2-T3", as well as bus line 200 which goes from terminals T1, T2, and T3 to "Avenida de América". The new terminal 4 (T4 and its satellite T4S) is used by Iberia and other airlines. See list of airlines at each terminal. It can be reached also by metro with the underground station "Aeropuerto T4". Bus line 204 goes from terminal T4 to "Avenida de América". Free shuttle buses link all four terminals. The metro ticket when going or coming from the airport terminals cost 2€. If you go to the airport from the city, you should buy a special metro ticket for the airport (2€) instead of the normal one (1€). If you take a taxi, the initial fare is 1,85 € and the supplementary fare for trips from/to the airport is 5 €. There is no extra charge for luggage. The taxi tariff, shown in the taximeter, is "1" (0,87 €/km) Monday through Friday from 6 am to 10 pm, or "2" (1 €/km) at nights from 10 pm to 6 am, weekends, holidays and in the path to CoNWeT Lab. There are no hotels within short walking distance. The nearest hotels are located in "Ciudad de la Imagen". However, these hotels are far from the city centre, so if you prefer to stay close to the city center we recommend the hotels nearby "Ciudad Universitaria". The recommended hotels can be found in the sidebar. The following hotels are close to CoNWeT premises, but they are far from the city center.